Why are so many strong female skaters from Russia? Yevgenia Medvedeva (Russia) performs her short program at the ISU Grand Prix of Figure Skating in Barcelona. Competition in women’s figure skating in Russia has never been so tough. Sochi Olympics heroines Adelina Sotnikova and Yulia Lipnitskaya and the world champion Elizaveta Tuktamysheva have given way to younger athletes. Many of them are under 15 years old. In December 2015, Russia’s national figure skating championship brought sensational results: both Olympic champions, Yulia Lipnitskaya and Adelina Sotnikova, as well as the current World Champion Elizaveta Tuktamysheva were left out of the top three winners, which says quite a lot about the level of competition. However, this season, these recent champions have fallen even farther from the winners’ circle. 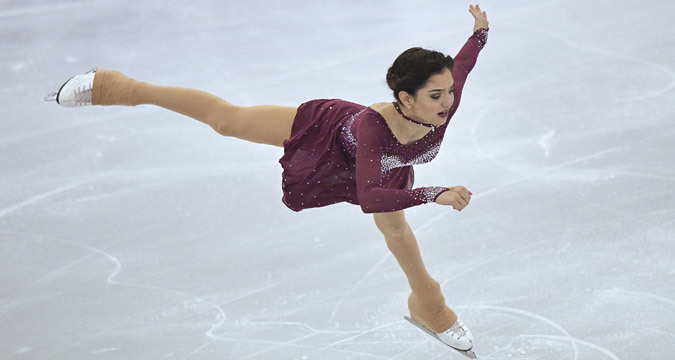 Other young athletes led by 16-year-old Evgenia Medvedeva, have come to the forefront. The equally young Elena Radionova and Anna Pogorilaya also achieved great results at the Grand Prix series final. Even younger skaters are getting ready for victories: 14-year-old Polina Tsurskaya, 15-year-old Maria Sotskova and 13-year-old Alisa Fedichkina already occupy high places in national rankings. RBTH investigates where this new golden generation of Russian skaters comes from. There have been prodigies in women's figure skating since time immemorial. Three-time Olympic champion Sonja Henie from Norway first appeared at major international competitions at the age of 11. East Germans Anett Pötzsch and Katarina Witt were stars in the 1970s. The former made her debut at the European Championship when she was 13, the latter at age 14. There was a similar youth project in the USSR. The legendary coach Stanislav Zhuk brought 12-year skater Elena Vodorezova onto the ice at the European championships in January 1976, in Geneva, Switzerland. With her funny braids, Vodorezova made a splash. In the short program she performed the 2 + 3 cascade for the first time in the world. Even men weren’t able to do this at that time. It’s a thankless task to compare a 15-year-old and a 22-year-old solo performer due to their differences in psyche and physical capabilities. However, sometimes both of them are involved in the same tournaments. Nominally age limits exist, but often athletes of rather youthful ages are allowed to take part in adult competitions. Lipnitskaya, Sotnikova and Tuktamysheva are three recent examples. Now, at an age when a female's body experiences hormonal changes, all three athletes have begun to encounter serious difficulties. “There should be age limits, taking into account the physiology of athletes,” says coach Tatiana Mishina. “Of course, for a little girl it’s easier to jump and not be scared. Young athletes are also considerably more stable. Everybody knows that. The body is arranged in such a way that nothing can be done about it." Today each one of the top eight Russian solo performers is capable of winning any international competition. Over the past 2.5 seasons at both the adult and junior levels Russians lost only two gold medals – the 2013/14 season Grand Prix finale and the World Championship were won by Japanese skater Mao Asada. A similar situation was observed in the late 1990s. Then the Russian team gathered a wonderful constellation of solo performers: Irina Slutskaya, Maria Butyrskaya and Elena Sokolova. But, unlike the present case, the age difference between the oldest (Butyrskaya) and the youngest (Slutskaya) was much more significant - seven years instead of three. Over the last decade, figure skating in Russia has been experiencing a real boom. Last but not least, its popularity is associated with numerous televised ice shows. The most successful one – "Stars on Ice" – was launched in 2006 by Ilya Averbukh, the ice dancing world champion in 2002. It is this television program in particular that has motivated parents to encourage their children to take up figure skating. Previous generations of top Russian trainers have carefully kept their professional secrets from prying eyes, so subsequent waves of coaches have had to reinvent the wheel. Surprisingly, they have greatly succeeded at this. Practically the entire top 10 of today's top Russian skaters have been “placed in orbit” by different coaches. The list of top coaches today includes Alexei Mishin, Eteri Tutberidze, Anna Tsareva, Inna Goncharenko and Tatiana Odinokova.